This photo was taken by Captain Yohn during a recent boat trip with other photographers. wow, look at those lenses. wow, those cameras and lenses must have been pretty heavy to lug around all day. I wonder what everyone is taking pictures of at the moment? That makes a fantastic picture. Oooh looks like fun, what a great collection of cameras these folks have. What a great capture! There are some pretty impressive cameras there! Those who photograph are phtotgraphed. What are they looking at? Funny. Thanks everyone for commenting. This was a photography group so mostly everyone had a big lens. 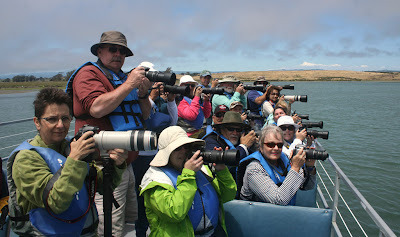 We were on a boating trip to look at wildlife and the boat captain asked everyone to extend our lens and to pose for a photo. I love this shot, great capture. great catch! what were you photographing there? sunny+happy rest of the week! 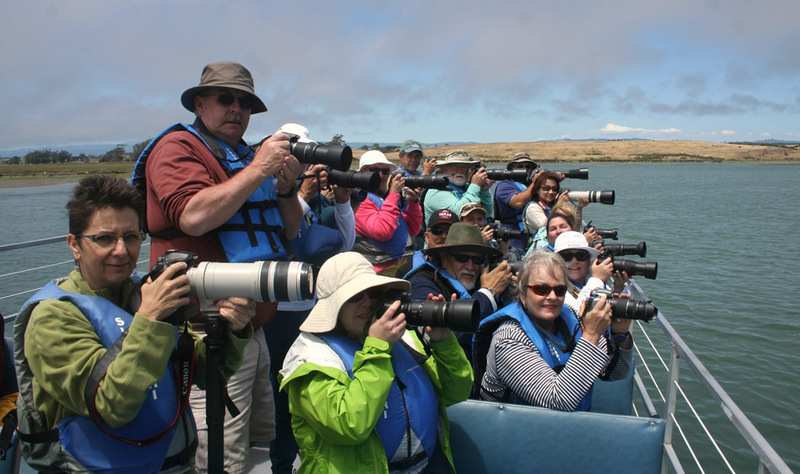 Jana: we were there to photograph wildlife particularly sea otters, but in this pose, the captain just wanted all of us to extend our lens to the fullest and just pose for a picture.